Dr Meghana Kambham, co-founder of Carengrow, will be participating at the GES in Hyderabad and spoke to TNM. The high-profile Global Entrepreneurship Summit (GES) in Hyderabad is just days away. Around 1,500 entrepreneurs from 170 countries are expected to be present, with Ivanka Trump being the chief guest. Among those representing India at the summit will be Dr Meghana Kambham, co-founder of Carengrow, who is one of the foremost entrepreneurs in the country. TNM managed to catch up with her for an interview. Prevention is better than cure but like any other developing country, India is caught in the web of lifestyle diseases. What can we do when almost 85-90% of medical diseases are preventable in the country? This is what irked Meghana Kambam, a 24-year-old MBBS graduate who had just passed out in 2014 with a medical degree from Andhra Medical College, Vizag. Her passion in preventive medicine got her into the prestigious Stanford University, where she pursued an Executive programme in Social Enterprise. Meghana says, "It’s a problem facing all developing countries. Knowing the problem in advance and systematically addressing it, will reduce the burden for a country like us." Leaving aside prevention, India spends 1.4% of its annual budget on treatment alone. The lack of a proper preventive healthcare system in the country is the reason behind this. Soon after graduating from Stanford, Meghana teamed up with like-minded individuals for a study. After doing the required groundwork and research, she came to know what Indians were thinking about 'preventive medical care'. Explaining how her dream project came true, Meghana said, "We understood that people are actually in dire need of preventive care. This is when Carengrow took shape with the aim of monitoring the physical, psychological and behavioural health of school children, using a digital application." Carengrow takes care of up-to-date profiling of the child and guides parents with the help of school staff. "We train the staff with our team of experts. These days parents are not in a position to know what multivitamins and how much iron should be given to their children, so we have designed digital and non-digital programmes for this." Now, Carengrow in collaboration with 120 private schools, has introduced its health curriculum. Carengrow has signed an agreement with two social welfare schools in Telangana in consultation with the Andhra government. As part of a pilot project, a government school with more than 1,000 students in Irwin village of Mehboobnagar has given positive results. Though the company began in 2015, it took one year to become what it is today. 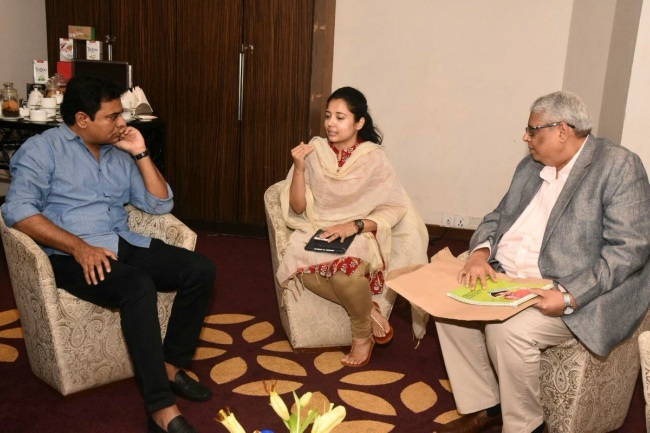 Carengrow has covered 12,000 students from Telangana and Andhra and expects to provide the same services to 50,000 more students in the coming six months. Dr Kambham is the only Indian woman entrepreneur to be shortlisted for Microsoft’s 2016 #MakeWhats-Next programme, which received around 16 lakh applications. Interestingly, Meghana adds, "In our three-phase (Screening +Intervention+ Behavioural Change) method, we found that kids who come from poorer backgrounds are much more adaptive and result-oriented." "As our motto is social impact, we will be charging less for public schools (the cost of which will be borne by multiple stakeholders including the government, CSR initiatives and individuals). The Telangana government, especially IT minister KT Rama Rao has encouraged us," she adds. Carengrow has a team of 36 dynamic members who are fully equipped with the knowledge of preventive medical healthcare and technology. It functions under an advisory board consisting of 10 members, including a paediatrician and other nutritionists. When asked about her source of inspiration, Dr Meghana says, "For me, my mother Susheela means everything to me and she has been very encouraging." Being thankful to her mother Susheela who is an educationist, she says, "My mother always stood by me and told me not to get distracted from my dreams, that’s the reason I’m here today." She strongly feels that those who have the potential to bring about change should follow it through and not give up.